Simply The Best: How’s Your Self Belief Holding Up? I’m always banging on about the importance of self-belief – you might have noticed! Well, this week delivered some powerful teachings that resulted in me swallowing a massive dose of my own medicine. It’s not that I hadn’t been walking my talk… I’m super invested in that – all part of living an authentic life and being true to my personal brand. What I hadn’t noticed, though, was that deep down, my confidence had taken a bit of a battering. Maybe it’s because I’d been so busy and running on empty somewhat. Or, maybe, I’d been so keen to keep myself away from ‘ego land’, I hadn’t allowed myself to fully celebrate my own successes or recognise just how far I’d come. When it comes to my clients, I’m always reminding them of their potential and helping them tap into that bank of ‘inner awesome’ we all have, as well as pointing out the differences between pride and arrogance and confidence and ego. I guess, somewhere along the line, I’d neglected to digest the full extent of those messages for yours truly! So, when my wife and a bunch of my clients collaborated to enter me into a prestigious awards programme, I really was surprised. The Best Business Women Awards is a well-established national platform that recognises the best of British female entrepreneurship, professional skill and work ethic. It highlights the amazing work of women across the UK, celebrating and rewarding the best of the best. When I heard I’d been nominated, I could hardly believe so many people had taken time out of their own busy schedules to create testimonials, submit videos and provide the evidence needed to support my entry into the ‘Best Coach’ category. Of course, though I was thrilled that so many of my friends and clients wanted to see me rewarded for my work, and for the help and support I’d afforded them, I never expected to be shortlisted. After all… this is a big, national awards programme and I’m just a lass from Lincolnshire wanting to make a difference. Imagine my surprise when, not only was I shortlisted, but I made it to the finals! I had been recognised as one of the country’s top six female coaches! Wow! My self belief muscles were starting to flutter and strain a bit. I found myself straying into the cynicism zone; I was involved in a few awards events during my corporate days… surely they were just trying to sell more seats. My dear wife, Asha, insisted we go along and one of our friends, Sally, who has also been one of my spiritual empowerment circle members for many years, also wanted to join us for the occasion. I decided to treat it as a networking opportunity and, of course, the chance to spend an evening with loved ones. As it happened, the event fell on October 11, which would have been my dear old dad’s 86th birthday, so I decided we could raise a glass to him as well. The night arrived and, on checking the seating plan, I saw we were seated towards the back of the room. That made up my mind. I was convinced I hadn’t won and I could just enjoy and relax. A fellow coaching pal was up for the same award and seated nearer to the front – that award definitely had her name on it. I was so certain, I even told her about my theory. She thought I’d win, I *knew* she’d win. We didn’t even think about the other four finalists – I suspect that would have made it all feel far too real! We sat at our table, toasted my dad, enjoyed a three course meal and got to know the amazing people we were sitting with that night. So many awesome business women making a positive mark on the world. As far as I was concerned, everyone who made it to the event had already won at life. I was about to nip off to the ladies when my category was announced. Asha insisted I sit down and stay put. They congratulated all the finalists and my table whooped and hollered when my name was mentioned – they really were getting into the spirit of the evening. Just then, something I couldn’t quite fathom began to unfold. The presenter started to talk about the winner – the finalist judged to be the UK’s best female coach. They talked about this woman overcoming adversity and using those experiences to help others, they talked about her TV and media appearances and her books… it was becoming harder and harder to ignore the fact that they just might be talking about… ME! When my name was announced, my table went into uproar. I felt like a rabbit in the headlights. This couldn’t be right, could it? So many amazing people in that room and they’d chosen me?! All I could think about was getting to the front of that room as quickly as possible… not so I could pick up my award, but so that I could find my friend and hug her before I did so. I still couldn’t quite understand why it was me, and I wanted to share the win with her somehow. Lights. Cameras. Interviews. Congratulations from so many people. The rest of that evening was a whirlwind. Even now, writing this days later, it still hasn’t really sunk in! If that was self belief lesson #1, the second one was a doozy! For a long time now, I’ve talked to my clients about the downside of working for free. Mine is a service industry, which means many of the people in it are driven by wanting to help others. That’s wonderful, but the downside is that too many coaches, therapists, healers and consultants end up depleting their own energy and resources helping others without reward. Whilst that’s admirable, we have to realise there’s a difference between giving off the cuff advice and support, helping in our communities where we can, and running a business without being paid. We still need to be able to cover our bills and expenses. We still need to be able to earn. My advice is usually to build your business to the point where the bread and butter basics are covered; once you know you have your outgoings covered and your work/life balance where it needs to be, you can do all the pro-bono work you like. I see too many exhausting themselves, too many spending all their time on ‘charity’ work and not enough on building their own income and supporting their own needs. Too many end up having to support themselves with several jobs, or end up quitting their dream and going back into full time employment. It’s counter-productive, isn’t it? Give too much of yourself for free up front and you end up either too depleted to help people long term, or tied into a job where you don’t get time to provide the service you feel is your mission. See? The balance needs to be right. Sometimes, when people don’t feel they’ve invested in something, they won’t be committed to making the changes that are needed to get them to where they want to be. They can fall into an attitude where they resist putting the work in and, instead, expect someone to wave a magic wand for them. I learned this the hard way. Nowadays, though I do offer partial bursaries for some of my programmes, if someone really wants to take part and genuinely believes they can’t afford it, I’ll explore a barter exchange with them. That way, the energies are balanced and they at least feel they’re contributing to the process. Working in this way, alongside my full paying clients I’ve sometimes had someone exchanging work/skills with me and even had beautiful items hand-crafted. Managed properly, this can work brilliantly. Not too long ago, though, I fell prey to my own bleeding heart and ignored all my own advice. I met a wonderful woman online who’d been through a hard time. Despite the curve balls life had thrown her way, this lady had some really big dreams and I wanted to help. For the first time ever, I offered to create a free one-to-one mentoring agreement. I wouldn’t want any payment, but she’d be expected to put in the work needed to be able to turn things around, with my support, of course, and our agreement would have to be exclusive – I wanted loyalty, and I didn’t want to end up in one of those messy ‘too many cooks’ situations, especially if I was to be giving my time and expertise for free. I was keen to make this part of our agreement as clean and easy as possible; people grow and change and, if she ever felt she’d outgrown me, or needed to work with someone else, we’d have an open and honest talk about it, decide on the best way forward, and all would be well. Offer accepted, our mentoring began. And then it happened. Only this week, one of the fundamental rules of our working agreement was broken. Worse still, there was no discussion beforehand… I only found out what was happening when I saw her posts on social media. Very clearly, our ‘exclusive’ mentoring agreement was no longer applicable. Oops… please be careful not to trip over my trust… it’s lying over there on the floor! Why was this a lesson in self-belief? Because I should have remembered the life lessons from before. Maybe, if I’d taken a moment to remember why I advise others not to gaily leap in and offer free help and expertise, I wouldn’t have manifested this situation. I needed to believe in myself enough to recognise that my help and expertise is actually well worth the investment people make when they hire me. Hell, I only need to look at all those clients nominating me for the award to get some clarity over that! You know what’s really great about it all though? I realised that, actually, my self-belief *is* strong enough and beautiful enough for me to not take this development personally. Trust… pick yourself up off that floor and get back over here, right now! Things happen. Life happens. It may well be that this lady was made an offer she felt too good to be true and just went for it without thinking. Even if that’s not the case, even if it was all planned for weeks, so what? So, she broke an agreement. It would have been nice to have had the opportunity to talk about things beforehand, but does it really matter in the scheme of things? No. It really doesn’t. I’m not going to carry any hard feelings. I’ve wished her all the best and I’m moving on – older, wiser, and far more aware of the need to give my self belief the nurturing I hadn’t realised it had been lacking! How’s YOUR self belief? How about giving it a bit of love and attention, right now? Go on. Do it. 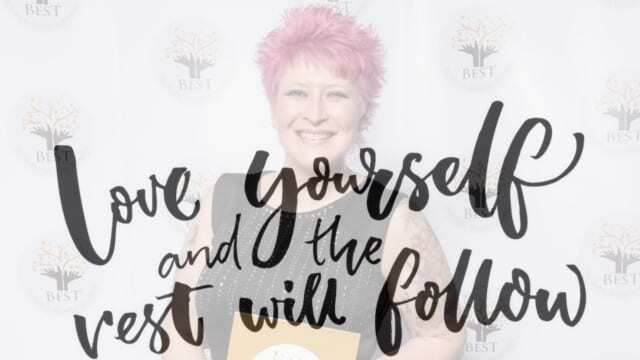 (Officially the UK’s best female business coach – according to the Best Business Women Awards 2018!) and according to America Out Loud as well!